As the day began I was thanking God for a restful night. Recall that Thursday night was rough and yesterday during the day wasn’t much better. The Lord strengthened me to minister last night, return to the hotel, eat my first Liberian Style Chicken dinner this trip and go to bed. This morning, though feeling better, I was still kinda queasy so made it a point to eat half a piece of toast and drink half a cup of tea (strong tea!) before heading to the church to conduct an extended training session. The training was awesome. As you can see, there was a nice turn out. After the training I went on a brief shopping trip (to Benson St., where else?!?) to find a shirt for the service tonight. I am bigger than most Liberian men so finding a shirt that fit (in the style I wanted) was no small feat, let me tell you. Still, with the help of Pastor Harris I found one. Service was OFF THE HOOK!!! Pastor Wennie ministered the word (he had 3 or 4 sermons rolled into one but the title that I captured that stood out most for me was, “Discover Your True Identity”)! Before he preached, the Praise Team and the 250+ people gathered sang a South African song, “I know who I am!”. Well, did the heavens open and the angels join in or what?!? Somehow, I’ve got to bring that song back to New York with me! Get ready, Min. Kim! What else could we do after that? It was time to celebrate! 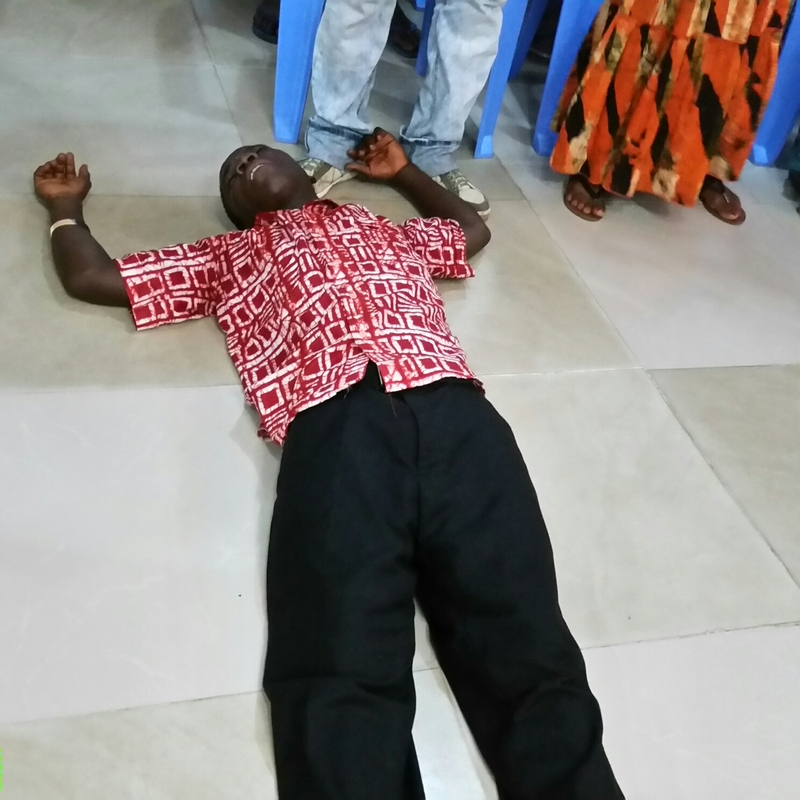 Lord, the people broke out in a Nigerian (Eboh?) song and danced a while. At one point Pastor Wennie motioned for his wife to join him and Mother Wennie led us to another level in praise! The woman danced, do you hear me Pastor Jeanette?!?! Hallelujah!!! Honey, as the Wennie’s danced you know I was missing Mother Vaughn (my Lady Jai!). Had you been here I probably would have grabbed you and absolutely danced myself silly. Instead, I danced with Mother Wennie and still almost had a fit! Then Pastor Wennie declared that tomorrow we’d really see some dancing as we celebrate the last day of the revival (and the 20th anniversary of Overcomers’ church—I’m the anniversary speaker, by the way!). He told the church they hadn’t seen him really dance yet. Help, Lord! You know I’m not going to be any good! We may dance to different beats and move in different ways but I already know this grandpa is gonna pick ‘um up and put ‘um down! When I think about what the Lord has done for me (just on this trip! ), when I think about how the Lord has set me free, when I think about how the Lord has brought me out, I can dance, dance, dance, dance, dance…!!! Gloraaayyy! OK, I’m back. I didn’t make it to Sunday, I had to dance around my hotel room a minute! So, back to where I started this post. The word that I captured was released by…wait for it…Mother Wennie! She and Pastor Wennie had stopped by the hotel for a visit because I might not get a chance to spend any time visiting with Mother Wennie between now and when I leave on Tuesday. Well, as we talked, the presence of the Lord was tangible in this room. As they got up to leave, Pastor Wennie asked me to pray and during the prayer the Lord directed me to pray for the stirring of the gift of the prophetess in that woman. IMMEDIATELY, she began to prophesy, “I am with you! You will carry my word! I do a new thing in you!” Hallelujah! So, like I said from the beginning, that’s how the 10th day of my journey (9th day on the ground here in Africa) has ended. Gloraaayyy!!! I can’t imagine many things more unsettling when traveling abroad than feeling sick and not knowing what options you have for redress, if any. After “flying” back to the hotel after a truly amazing worship experience last night, a few hours later when I went to bed I was almost immediately not feeling well. I literally thought that if I didn’t get some relief I might have to see if I could get a flight home today! I made it through the night, not much sleep though. I still didn’t feel well this morning and thought that I’d have to cancel all or at least part of my very full agenda. I just couldn’t! So I didn’t! I thought I was about to pass out at the beginning of my first meeting but clung to faith and soldiered on…through 7 meetings, followed by an 80 minute drive to Brewerville, another 80 minutes back to Monrovia and a room change (from 201 to 110 since the TV and Internet weren’t working—110 is the same room I was moved to when I was here 2 years ago…that time because the room I was originally in was, well, not one the hotel wanted even their worst guest occupying). After all that I just had enough time to change and head to service. I decided not to call my wife to tell her I was not feeling well (and that the only place I’d wanted to be at the height of my discomfort was at home with her and the kids). I didn’t want her 7 thousand miles away worrying but I needed her and the Intercessors to pray so I called her before service. Naturally she was concerned to learn that I was feeling sick and that I was still going to go minister and hadn’t my hosts how bad I was feeling but I did sense, nonetheless, that she trusted me to do the right thing (although if she’d had his number she certainly would have called Pastor Wennie and ratted me out). She did make me promise to let the pastors here know that I needed their prayers. I did. God answered! The service was off the chain! So why the drive to Brewerville? 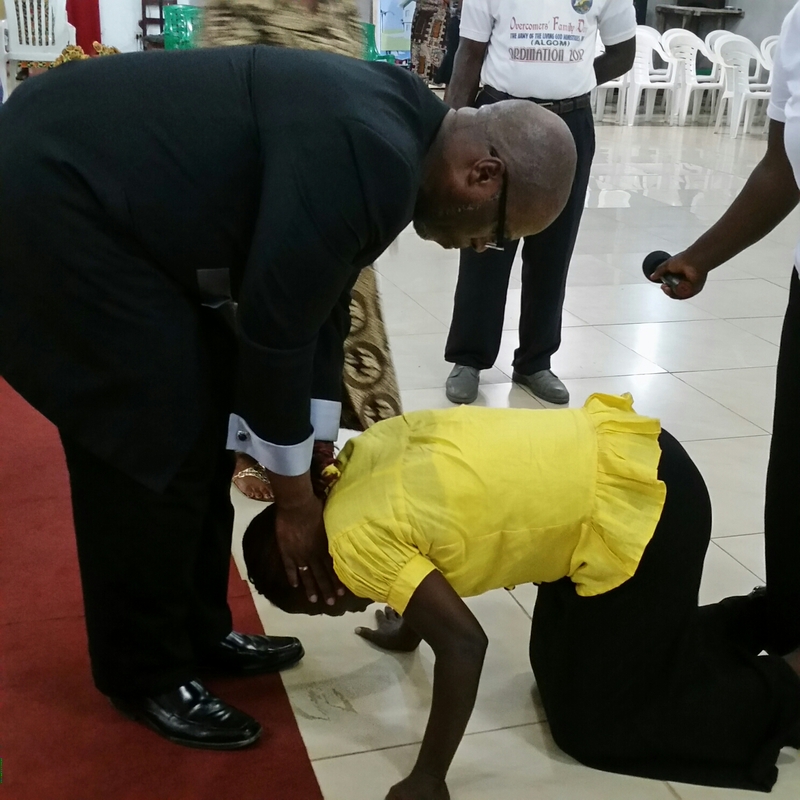 Well, see for yourself: To see Pastor Ogunwumi! Liberian Style Chicken. Need I say more? My first full day back in Liberia has been great! I had a great meeting with Pastor Anthony Wennie, the president of OHM Liberia and then had a productive meeting with the entire executive leadership team of the Branch. After the meetings it was back to the hotel to do some work and finish preparing for the revival service I was slated to minister at tonight. As the time drew closer, I found myself growing more and more excited to be used by God however he chose. And use me, he did! I make my boast in the Lord when I tell you that Mattie’s boy preached tonight! Hey, hey!!! I was led to use the opportunity to continue sharing on the topic, “Divine Encounter”. Oh, but tonight, unlike the word that was released in Ghana, the Lord really had a focus on our enemies. The backdrop was fear. Just like unforgiveness, many of God’s people are bound by fear; especially fear of their enemies. We agreed and declared tonight that we would no longer be bound by fear. Because God has not given us the spirit of fear, we do not have to accept it! Another focus tonight that was different from in Ghana was on the idea of being arrested. Those back home will note that God has, well, arrested me with this topic of being arrested and the fact that when we are arrested by him it is certainly a divine encounter. In Paul’s case after he was on his way to arrest the people of God in Damascus and wound up being arrested by God instead, it changed the entire course of his life and the life of the church. 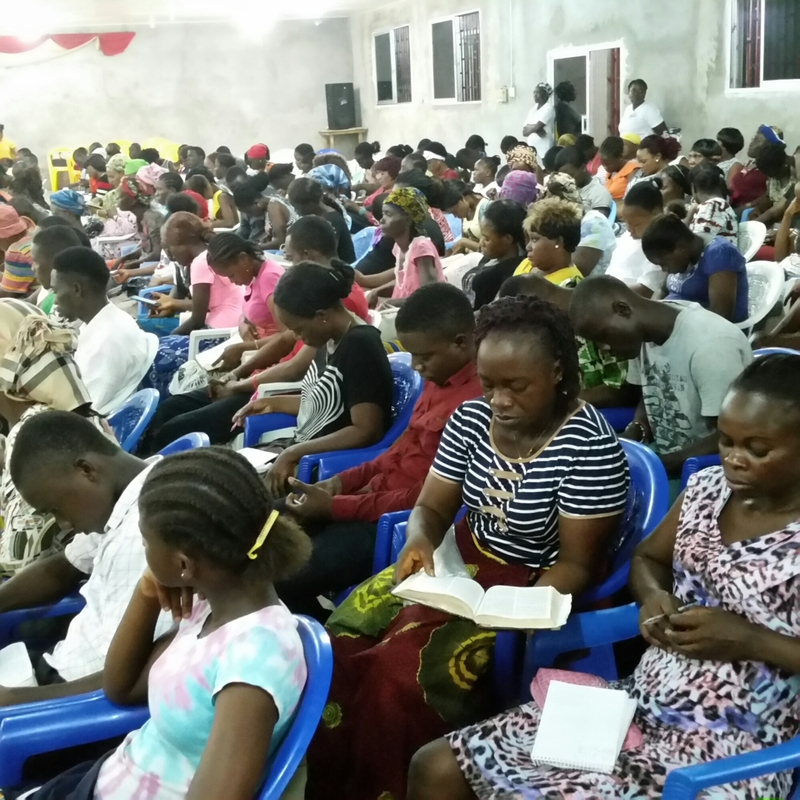 By God’s grace, he caused me to declare that the church in Liberia and even the nation, like the church in Paul’s day after his conversion, is entering a season of rest, revival and multiplied increase! Hallelujah!!! All it took was for one enemy to have a divine encounter! Instead of petitioning God to just remove our enemies, we asked him to give them a divine encounter! Rest, revival, multiplied increase! O, I receive that for the church in America as well. Glory!!! I reminded the crowd that Liberia had encountered several enemies in the recent past: an enemy named civil war, an enemy named poverty, an enemy named governmental corruption, an enemy named Ebola…but because there is a God named Jehovah in Liberia who is bigger than any enemy, Liberia is still standing. The words of that prophetic song that I heard on my first trip here, in 2003 during the war, dealing with armed soldiers at checkpoints every night and a devastated nation during the day, those words rose up in my spirit tonight and leapt out in a prophetic declaration: “Liberia, sweet land of liberty, we prophesy to you: You will rise, you will shine, you will prosper in Africa and the world!” It is so, in Jesus’ name! Before relinquishing my stand, I called for those who had been gripped by fear to come to the altar—reminding them that the work of deliverance had already been done and declaring that the altar work was a point of contact for the release of the full manifestation of the work. There may have been 100 people who flooded the altar! They will never, ever be gripped by fear again in Jesus’ name! Well, by the time I’d been escorted out of the church and reached the car for the drive back to the hotel, I declared to the men bearing arms for me that I might not need the car; I could just run back, I was feeling so high! Back at the hotel I was still flying. I couldn’t even order dinner! I settled for a few Vienna sausage, some Pringles and two Oreos for dinner. I drank a Coke, wanted another, but opted for a little fruit juice and a bottle of water instead. Maybe I’ll be able to chow down after tomorrow night’s service. I’m preaching again and expect the next round go higher! Thanks to Pastor Topoe (and new batteries) I do have several pictures and video clips from tonight but the Internet is so slow that I can only connect by phone so can’t get my photos from the computer onto my phone. I’ve included an “after glow” selfie instead. The “divine encounter” continues! 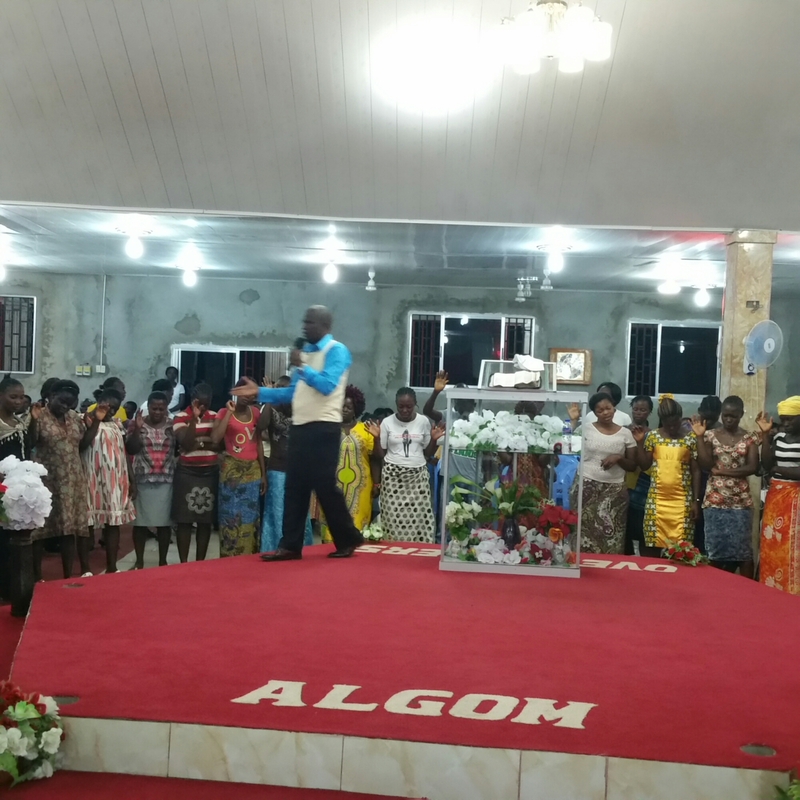 Just hours after landing in Liberia this afternoon (flight was blessed—I’ll share more about it later) I found myself at a worship service at Army of the Living God Ministries/Overcomers; 17th day of a 21 day revival. 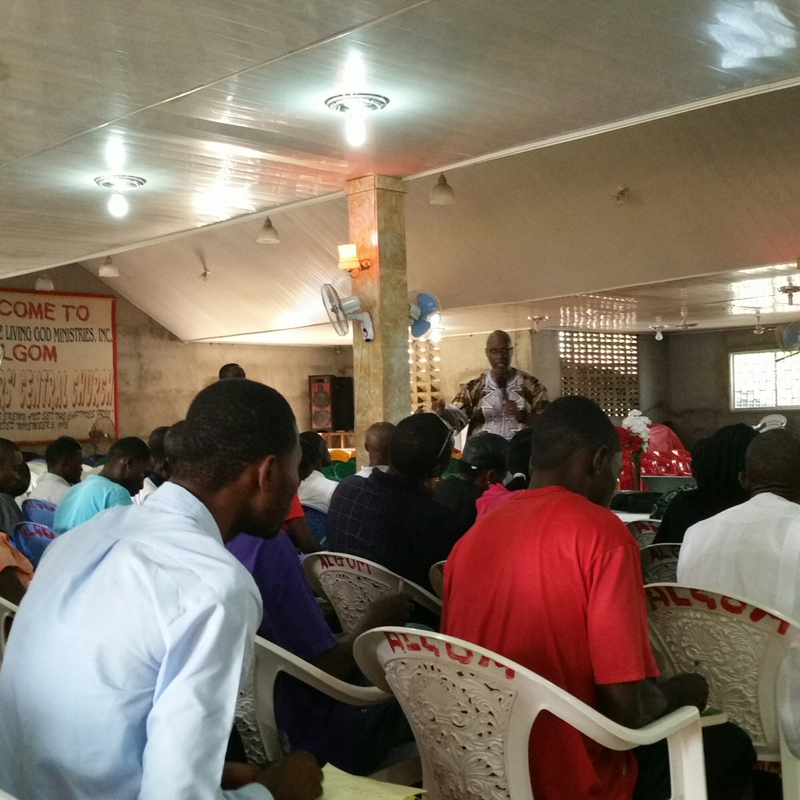 Pastor Anthony Wennie (Pastor at Overcomers and the OHM Liberia President) was the speaker. He ministered for maybe 20 minutes and then had an altar call for those who have been bound by…wait for it…unforgiveness! (Remember the walls that were torn down at Faith To Face Ministries last Sunday: Fear and Unforgiveness!) 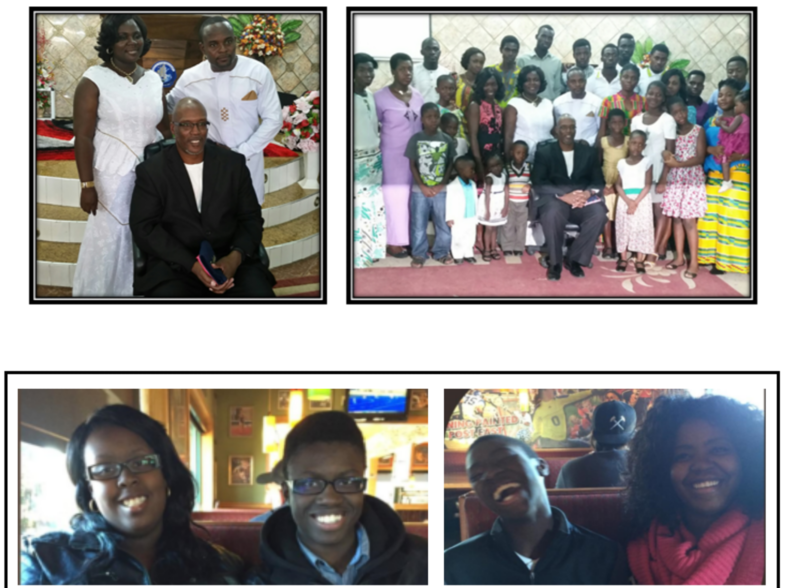 As you can see from the picture below, the altar was filled! Perhaps even more surprising than the altar being filled was what happened as Pastor Wennie began to pray. 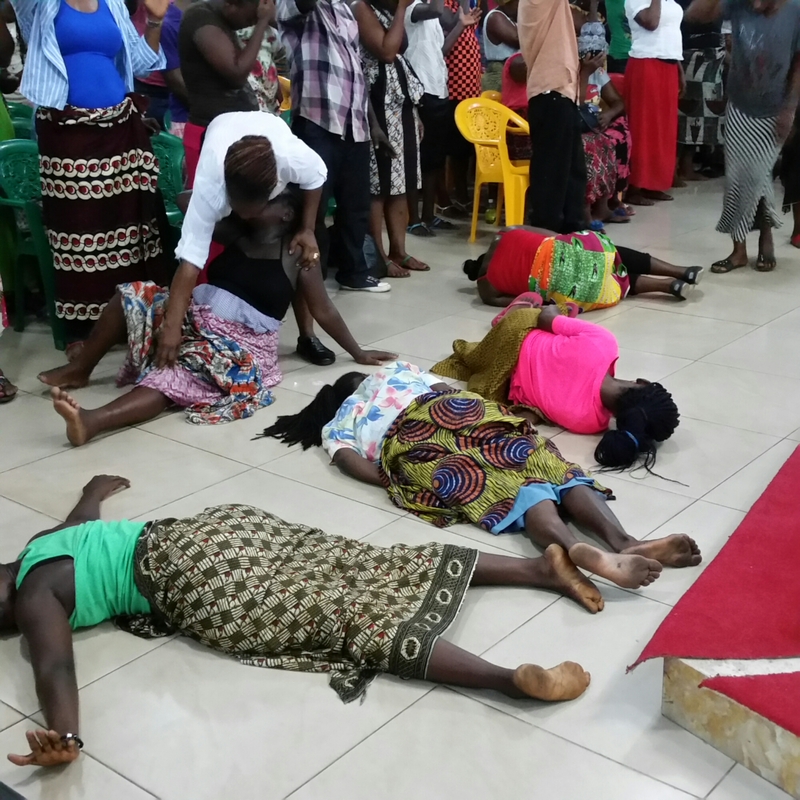 People began dropping like flies under the power of the God and then powerful manifestations and demonstrations of deliverance ensued. It was really tremendous to see (you have to take my word for it because when I tried to video tape I found the batteries in my camera were dead!). After an hour of deliverance ministry, Pastor Wennie encouraged those who were in need of healing to lay hands on themselves and receive it! Another wave of dropping under the power ensued! The kewlest thing, though, was witnessing a dozen or more young people (all young ladies) respond to the invitation to receive salvation. Oh, you talk about rejoicing! We danced a few sets after that (and some of it I did get on tape using my phone). The celebration continued into the time of giving and at one point I thought I might just have to stop, drop and roll myself! The praise was just that high! Guess who’s preaching the next two nights? This guy! I told Pastor Wennie that after a service like tonight’s I don’t know what God could possibly need me for! His reply was, “just let God have his way!”. Deal! OK, let me back up to how the day started. I got up, cleaned up and was heading to the airport by 9AM. There was a bit of a mix up with communications so instead of 2 people taking me, 5 actually showed up (in two different cars at different times). In the end, it wound up being an unexpected opportunity to see just about the entire OHM Ghana leadership team one more time before departing. I made it through check in (I was praying that the bag I was checking wasn’t overweight and that my carry ons wouldn’t be an issue because I couldn’t check my briefcase nor my small but bulging suitcase because I had a laptop in each plus a projector in the suitcase—all was fine!). Made it through immigration, security and second security with no problem. After all of that, wouldn’t you know that after I passed through the final screening and was lugging my admittedly swollen carry ons down to the bus that would take us to the plane, the final agent calls me back and says she’ll have to check one of my carry ons. I didn’t want to protest too much but I wanted to keep my things with me even more than I didn’t want to protest so I told her calmly but with finality that I had equipment in the carry on in question that really needed to stay with me. She relented and I kept walking before she changed her mind! Landed. Might have been my best flight yet from Accra to Monrovia. Once off the plane, it was down the stairs, onto and then off a bus and just like that we were at the arrivals hall…and right into a bit of a human traffic jam. What was the hold up? Hand washing stations. Part of the post-Ebola-crisis-reality. The station consisted of a dispenser (like the big jugs with the tap at the bottom that we often use for punch at picnics) with water running out of it. No soap, no towels, nothing. As you can imagine, there wasn’t a whole lot of washing going on. After the half-washing station there was a thermal scan (consisting of a woman standing at the entrance to the queue—with a device that looked like what the doctor uses to check your ears—motioning for me to take off my glasses so she could get a reading). Immigration was easy. The examiner gave me a permit for a month even though I told him I’d only be here for a week. After that it was on to baggage claim but not before another thermal scan and a passport scan. (I was actually annoyed to see that some people—like me—were stopped to have their passports scanned while others weren’t. I complied and tried not to get an attitude but I might not have been 100% successful—I know because when I got to Customs and the same thing was happening I couldn’t help it, I had to ask why some of us were being stopped to have our bags searched while others weren’t. No real explanation was given (after the agent looked at me as if to say you’re not supposed to be questioning my process). So that, as they say, was that! 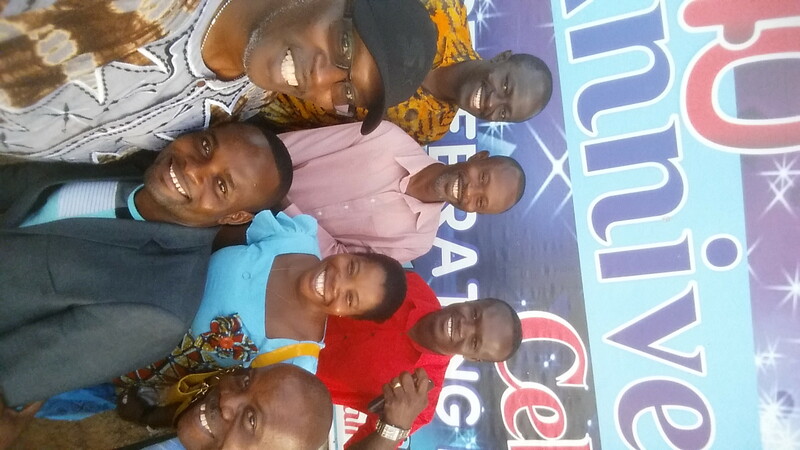 Exiting the terminal I spied 7 of the OHM Liberia leaders (pictured below: clockwise from me there’s Pastors Gibson, Harris, Zawoo, Ayenje, Topoe, Payne and Wennie). They greeted me warmly and I was “home”. Can I confess something? After the traffic in Accra, I love the roads in Monrovia! We drove an hour from the airport to the hotel (it had been raining but, bless God, the storm had passed before we arrived so the turbulence that we had been told to expect prior to landing was not realized at all!) and within minutes I was all moved in to my “new home” courtesy of OHM Liberia (they let me know months ago that they wanted to take care of my hotel—how kewl is that; they’ve even assigned—Dr. Celeste—a car and driver to me for the duration of my stay…you know I was touched!). The guys and I prayed and then they left me to rest but instead of resting I unpacked and then called my driver (listen to him, “his driver”!) to let him know that I wanted to go to the UN Store to pick up a few items—but I wanted to walk not drive. The place is only two short blocks from the hotel. 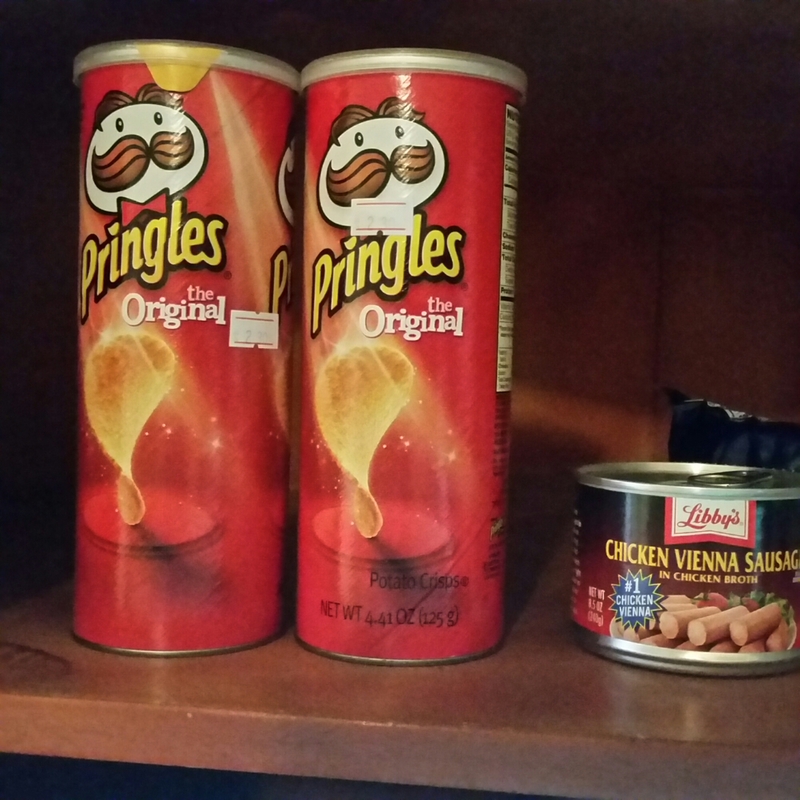 You already know what I got: Pringles, Dimes juice, cookies (what was I thinking, they taste awful!) and Vienna sausage. Cue the Hallelujah Chorus! I’d be set until after service—then I’d think about dinner…or just have Vienna sausage and Pringles and call it a night. And what a night it turned out to be! Those words aren’t mine, I happened to see them on Facebook today, the 6th day of my journey and final full day in Ghana, West Africa. Though the words aren’t mine, I share the sentiment. Who knew that I’d leave the country and a pre-Christmas coffee crisis would erupt? My two cents: If Starbucks is already on record stating that they only want your business if your personal beliefs align with theirs, if yours don’t then why are you still buying their coffee—regardless the color cup it’s in? I’ve never been a coffee drinker but do think I’ve seen lots of Christmas references at Dunkin Donuts when I stop by this time of year for some hot chocolate. Just sayin’. What a special day today was. I met with the executive board of OHM Ghana (check out the picture below: clockwise that’s me, Rev Samuel Damptey – Vice President, Evangelist Odoi – Treasurer, Pastor Isaac Amoah – President, Minister Comfort Amoah – Executive Board Member and Pastor Gordon Tackie –Secretary. Completing the group is Apostle Paul Azalekor who was special guest today. Our remaining executive board member, Minister Gertrude Arkhurst, was absent due to work in the Eastern Region of the country this week.) The meeting, the fellowship and our time of prayer was truly wonderful. As we sat around meandering from reflection to commiseration to laughter to envisioneering, I found my heart filled with thanksgiving for the awesome privilege and weighty burden afforded me by God to be a servant leader to the people here. I was also humbled as I recounted how thankful I am for the support of my wife and our children, the Faith To Face family and even my leaders at work for the roles they play in my service to West Africa. I’ve been touched on several occasions over the past few days when someone noted what a great sacrifice it is for someone to leave their homeland, their family, their ministry, their job and travel here. While my primary reason for doing what I do isn’t to have people harp on my sacrifice, it’s been touching to know that it is recognized as such. When my wife and children don’t stand at the door crying and begging me not to go when it’s time to depart, I know they get it—that this is what ministry looks like. In many ways it’s their calling as much as it is mine. Our baby was just 6 months old the first time I travelled to Liberia and that was when there was a war going on there! I know they worry when I’m away (especially when I’m travelling alone) but they never show it (at least not to me—I’m sure they show my wife). Jeanette, Karissa and Brandon, Kyela, Cullen, Carrington and Clay, I sincerely thank you for the grace you extend to me to do ministry at home and abroad. Your faith in me (and, more importantly, in God and what he has called me to do) has been a special blessing to me during the trip. As is always the case when my journey ends in one place and begins in another, my emotions run sad and sweet (not sure why we say bitter and sweet—I’m not at all bitter about leaving Ghana, just a bit sad that I won’t see my Ghanaian sons and daughters for a while). It’s 11PM, I’ve been packed for a few hours and am excited to move on to Liberia. The planned itinerary there is pretty non-stop as usual but after 2 years without being able to get there I wouldn’t have it any other way! The second thing I mentioned needing to devote an entire post to is the dreaded traffic. Picture rush hour in New York City, let’s say from Manhattan to Queens, traveling on both the Van Wyck and through city streets—only there are essentially no stop signs, no traffic lights, no speed limits and literally a “ride or die mentality”. Got the picture? Welcome to traffic in Accra! Apostle Paul (and before him Evangelist Odoi and Pastor Isaac) are probably the most anointed drivers in all of Ghana! I observed that every time we left the hotel, Apostle Paul prayed when he got behind the wheel and when we returned safely to the hotel he gave thanks. I quickly learned why and soon joined him! Aye! (You have to be here to know what “Aye!” sounds like when the Ghanaians declare it—trust me the traffic deserves an “Aye!”.) You know what is most amazing? On busy stretches of what we would call parkways, where speeds reach 65 or higher (albeit for just a few yards at a time—OK, I’m exaggerating…or am I? ), there are vendors called “Hawkers” who walk along the sides of cars (we’re talking cars in 3 or 4 or more lanes of traffic!) at the few intersections that have lights and sell their wares. Mind you the cars often aren’t completely stopped when the Hawkers approach and often they are still in the street when the light turns green and the cars pull off. I asked Pastor Isaac if they often get hit. He said matter-of-factly, “Oh, yes, they get bumped from time to time”. I decided that the Hawkers must be the most faith-filled people in Ghana! In Liberia, breakfast and lunch are the same for me as in Ghana. As for dinner, well, ask anyone who’s ever gone to Liberia with me what the dinner staple is…Liberian Style Chicken! I also found a tasty Chicken Parmesan at The Lion’s Den and found a fried chicken basket paired with French fries that’s pretty tasty. I did try a spicy roasted fish after several years as well but thank God for chicken! Oh, and Vienna sausage! One of my first stops in Liberia is at the UN Store or the upscale grocery store downtown where I stock up on a few cans of Vienna sausage and a few other snacks. Don’t knock it ‘til you try it! Wait, party over here? Last night there was a “Koffi Annan” meeting on my floor that got a little loud at times. Tonight there must be a birthday bash and the revelers sound like they’re at a college frat party. It’s 9:30PM; at 10 grandpa’s going downstairs to the front desk to make a little noise of his own! OK, it’s about 10:30 now. The revelers are still at it but they’ve calmed down a lot so I will too. Reflecting on the day I am, of course, thinking about that sense that I had that God was going “off script” today. I did have a few surprises today. First, I had an unplanned opportunity for an extended visit with Rev. 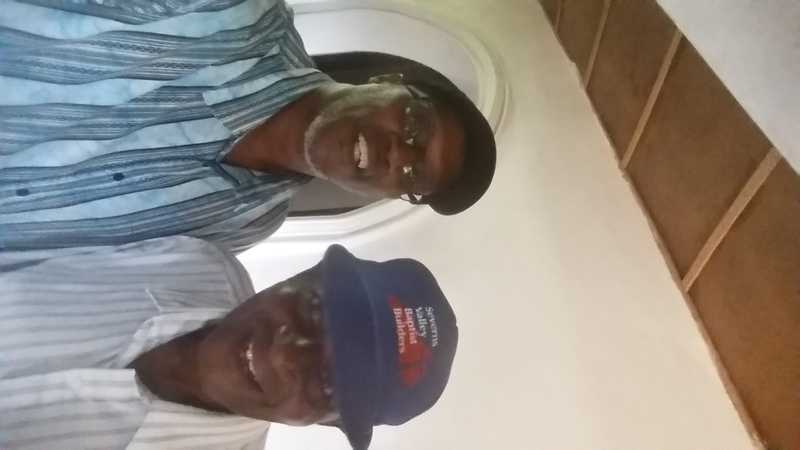 Isaac Amoah and Rev. Samuel Damptey, the OHM Ghana President and Vice President, respectively. During the fellowship we talked about everything from how ministers here often arbitrarily declare themselves Apostles and Prophets and Bishops and can even pay for the credentials to “prove” it (same happens in the States, I shared) to concerns about people church hopping in Ghana (ditto in the States) to the ongoing difficulties acquiring travel visas (same issue we’ve faced in Liberia for more than a decade). As different as we are, we are alike in so very many ways! Pastor Isaac and I spent hours meeting 1-on-1 discussing the business of the OHM Ghana Branch, other ministry interests that I have in Ghana and continued developing our own best practices for communications. One really kewl discovery for me regarding communications was the “WhatsApp” app. It’s used by “EVERYONE” here to send messages, pictures, videos and even make calls—for free. I set it up, established an OHM Ghana group and sent my first communique. It worked! When sending texts I might get a 1 out of 6 response; with WhatsApp, the response was 5 out of 6 in short order! OK, Liberia, time to find out WhatsApp?!? I started to order dinner en suite but decided that if there were any other off script moments in the offing I’d better get out of my room. I went down to the lobby and, rather than head right into the restaurant, I stopped by the front desk to ask about how I could make copies of handouts for my meeting with the OHM Ghana Leadership Team tomorrow. After showing me to the “business center”, I walked back to the desk with the guy who’d pointed the center out to me and asked him which of the many newspapers on display by the desk was the most reliable. After he (and Edith—the desk agent who’d checked me in back on Friday who’d also asked for prayer) spoke with me about the papers, as I walked away he called me back over and said, “You are a man of God. You must bless me”. I didn’t ask how he knew I was a man of God (Edith?!?) or what made him think I had a blessing for him (Edith?!? ), I just said, “OK”. “I’m ready now!”, he declared when I looked like I was about to walk away (and pray for him later…after dinner…before I went to sleep…maybe…you know how we do!). Mind you, we are standing at the front desk in the main lobby of the hotel. I took his hand, he bowed his head, and I prayed with him. When I was finished I asked, “What’s your name?” Steven, he answered. “Are you a believer”? Yes, he replied. “Where do you go to church?” __________ Assemblies of God (I didn’t quite get the name of the church). It was on then! Another person at the front desk (not behind the desk—someone staying at the hotel?) stopped me and said, I want you to bless me, too! This time my interrogation came first: “What’s your name?” He replied with something I caught and then lost as soon as I caught it. (Cue the grandpa jokes!). “Are you a believer?” Yes! Where do you go to church? Again, the church was named but I can’t recall it now. We prayed. That wasn’t it…a third guy stopped me (all of this was literally within 4 steps of the first guy) and was looking like Do not pass me by! “You want prayer, too? (Yes) What’s your name? (Samson) Are you a believer? (Yes)”. We prayed. That was certainly off script! I mean, when was the last time you had a prayer chain start at the front desk of the hotel you were staying in?!?! Back on the roads of Greater Accra, tomorrow. The revelers have started up again. It’s 11PM; time for grandpa to see about breaking up the party! …And now I’m writing. It’s been 4 days since I left home and 3 days here on the ground in Ghana. 3 days from right now, by God’s grace, I will be writing from Monrovia Liberia. (Actually, 3 days from right now I am slated to be ministering in revival at Overcomers Church with Pastor Anthony Wennie). Today was blessed! For the third consecutive day (the 3rd day!) 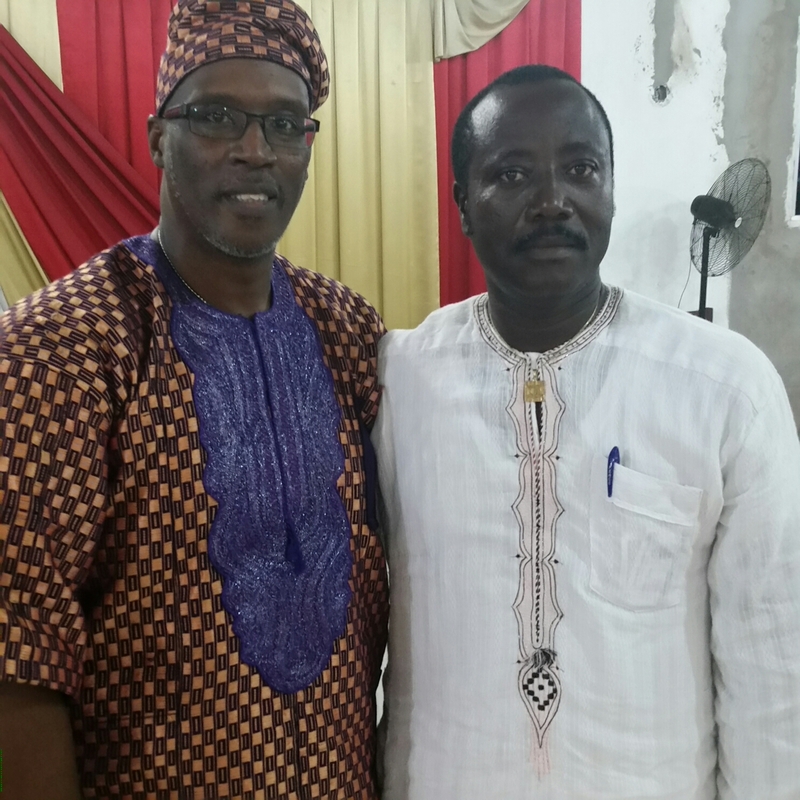 I had the opportunity to fellowship with Apostle Paul Azalekor and the Voice of Victory church family. I really felt at home during the worship service (even having an interpreter has been “normal” this time—Grace is the name of my interpreter and I made it a point to ask the congregation to join me in thanking her for her wonderful, “grace-ious” service). The message was an encore of “Strange Fire” first ministered at Faith To Face on November 1st (you HAVE TO get the CD!). Just like at Faith To Face, when we got to Hebrews 13:15 – 16, we had a praise break! Hallelujah!!! At the end of the service I was asked to bless the people (I was happy to) and then was slightly embarrassed to learn that they’d planned a photo shoot with me. Literally, out came a photographer and the pastor’s special chair and the photos commenced: First with the pastor and his wife, then with them and the associate pastors, them and the ministry’s leaders, the entire congregation (sans the musicians and praise team aka the Choristers) and then with all the Choristers and the Sunday School class. Needless to say I was a bit choked up to be received with such warmth. I held it together, though. Men aren’t known to be criers in Africa (so I’m told—not sure that I buy it!) and my new family probably isn’t ready for my “cry face”! Thinking of family, when I saw the pictures I kinda felt like a grand/father with his children and grandchildren gathered for a family picture. Don’t get any ideas, though, Faith To Face! Only in Ghana will such a title be permitted! (OK, maybe I’ll be more chill about it when I actually have natural grandbabies. Maybe it’s the new beard that’s got them thinking of me as grandfather! Hmmm…). Apostle Paul (I just noticed how kinda kewl that read, “Apostle Paul”) has truly been kind. He rearranged his entire schedule to host and bear arms for me (it’s like he’s been “assigned” to me, Dr. Celeste!). He has spent hours (literally at least 12 hours since Friday) coming to pick me up, take me to the church, bring me back to the hotel and then go home or pick up others and drop them off. (Sound familiar, Lady Jai?) He insists on carrying my briefcase and anything else I’m holding and when I tried to contribute to the fuel he protested…AND WON! How could I help but bless him? I pray a double portion of honor and recompense on the life and ministry of Apostle Paul Azalekor in Jesus’ name! I only have two more days to finish the work for this trip in Ghana. I have meetings scheduled tomorrow and Tuesday but am expecting a change up for some reason. I feel like God has more for me to do or more that He wants to accomplish while I’m here but it’s not on the planned agenda. Pray with me concerning this, won’t you? Well, it’s after 9PM. Still not bedtime for this grandpa so I’m going to do some reading. My wife gifted me a copy of John Bevere’s “Good or God?” for Pastor’s Appreciation month and I started reading it on the flight over. I don’t think I reached page 5 before conviction and excitement and confirmation and intrigue all merged into an I-must-finish-this-book-before-I-leave-Africa experience! It’s definitely one you should check out for yourself. I hate traveling on the roads in West Africa! (OK, to be clear, I’ve only travelled on the roads in Liberia and Ghana—and in particular I really dislike the roads OUTSIDE of Monrovia and the roads IN Greater Accra.) I’d need to dedicate an entire blog entry to say more but for now I’ll just give God thanks for safe travel! 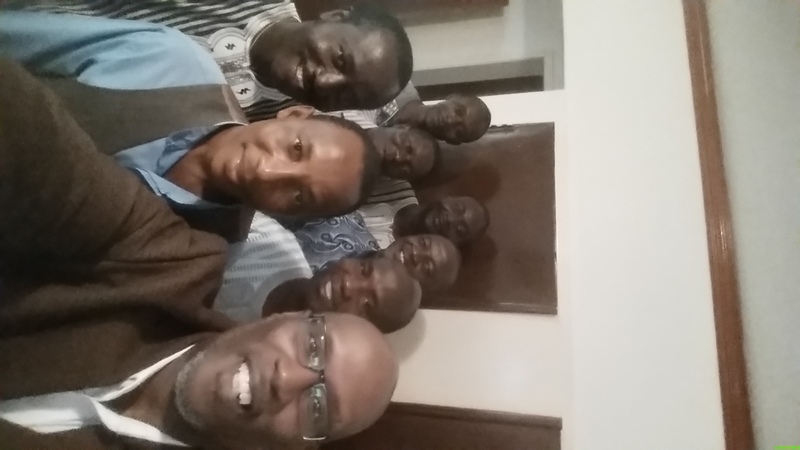 Day 3 of my journey back to West Africa has been a special blessing. I had the privilege to spend a few hours introducing many new pastors and ministers to the On The Mark International Pastoral Fellowship (OHMIPF or just OHM) and providing both existing and future members with what turned out to be a riveting training on what it means to be a minister. During our time together, a really helpful demonstration involving group interaction shed light on two realities that may be universal: 1) As ministers, we may not know as much as we should about what’s affecting our “sheep” and 2) When we do know what’s affecting them (especially en masse), we often do little more than talk about the matter (rather than praying for God’s intervention and His guidance regarding how we should address the issue). I stressed that, as ministers, our reaction to the news (national, regional, local, “on the street”) should be to pray about it, teach about it and/or preach about it. To respond to the part of the question about teaching I asked if there were any teachers in the room. No one raised their hands at first so I reminded the group that, even if teaching isn’t your profession, as a minister you are more than likely teaching in one way or another. What does teaching require? What must I have in order to teach someone something? “Information!”, was one enthusiastic response. I piled on to that by noting that before we can teach about a thing we must first be a student of that thing. As ministers we too often use our “preaching talents” as a substitute for actual study and preparation. Remember Paul’s instruction to Timothy, though: “Study to show thyself approved unto God”! Question (from the audience): What if the sheep continually resist the shepherd’s care? My response: You have a rod and a staff and need to use both. The rod is for correcting (in love) and the staff is for directing and (if necessary) rescuing. Sometimes the sheep do run off; that doesn’t absolve you of your responsibilities as their shepherd. You do whatever is in your power to return them to the flock. Oh, by the way, I’ve had three more little kid moments. Remember the little girl I mentioned on the plane? Well last night I got Hi 5s from Desmond and Dennis, Apostle Paul’s sons (age 3 and 2, respectively) and today I was sitting in the pastor’s office by myself when the daughter of another pastor came in (she can’t be any more than 5), walked over to me and struck up a conversation. “Is that your phone?” she asked. Yes, I replied. As sweet as you please she reached over me and began playing with my phone. She’s pressing icons and dialing real phone numbers! (I had put it in Ultra Power Save AND Airplane mode when I was en route to the church, though—see, God knew!) “No games?” No, no games. “No calling?” No, no calling. She was done with me and I was alone again in the office! Kids are the same all over the world—only, when I was 5 I’m sure I was not as adept with a rotary phone as this little lady was with my S5! 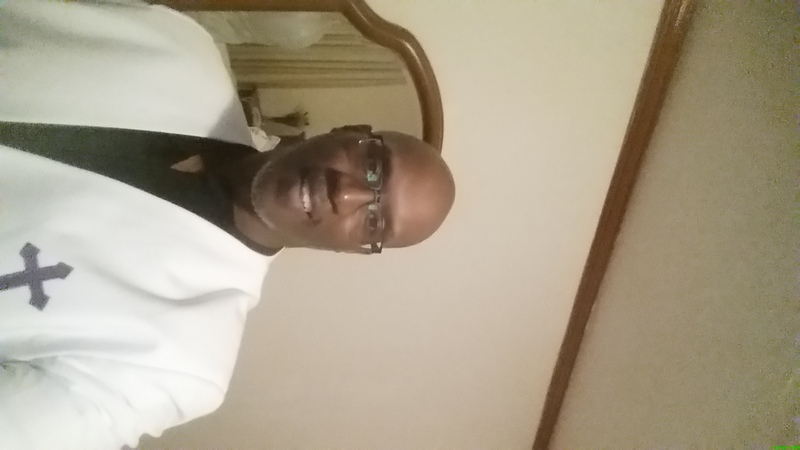 Preaching tomorrow at Voice of Victory (was originally invited to another church but the pastors decided that we should just stay with the move that God has ushered in at Voice of Victory). I’ve even been invited to attend a special concert in the afternoon. I mentioned that I really enjoyed a song that was ministered last night before I delivered the sermon and so the praise team made a video recording of it for me so that I can sing it when I return to the states. Now they’ve declared that “our grandfather (yes, grandfather—I’ll need a separate blog for that one, too!) loves music so much he must grace us with his presence at the concert if he is available”. Now, understand that after 13 years traveling to Liberia, I still don’t understand half the songs that are song there—and they’re mostly in English! Here in Ghana they sing in so many dialects that 90% of the time all I can do is sway and clap—and sometimes that doesn’t even work out too well! Still, I may go. I am grandpa after all. The trip here was blessed thank God. I made some observations as I traveled. I noted to my Ghanaians sons that I have never seen any people board airplanes like Liberians and Ghanaians. Usually in the States we’re used to being patient while waiting for our zone to be called. That has never been the case for any of my trips to West Africa (all the way back to my first one in 2003). As soon as the boarding process starts there is a mad dash to the front line. The agents can say until they are blue in the face that you don’t need to get in line until your zone is called, the people are ready and that’s all there is to it. The only thing even more dramatic, is when we get off the plane. People may have placed their carry-ons all over the plane but that does not stop them from literally walking all over you trying to get to the luggage even if it is against the flow of traffic. For the most part, though, everyone takes it in stride and everyone manages to get on/off the plane or in short order. Though the flight over was blessed, there was actually more turbulence then I remember ever experiencing before. I also don’t recall the plane being so cramped, oh my goodness! I literally don’t understand how the space between rows can be as small as it is. 10 hours in such uncomfortable quarters may certainly contribute to people behaving badly from time to time. Fortunately that did not happen on my flight to my knowledge. One of the highlights for me of the flight over, perhaps, was when a little girl (she looked like she was maybe four years old) had gotten away from her seat and was walking the aisle. She stopped, looked me in the eye and waved. I waved back and she kept walking. Though alone among what I guess was 200+ strangers, that act made me feel like things were OK.
ok, the clock is ticking, so let me get to the point with respect to the service tonight. I was blessed to be asked to minister at a worship celebration at a church I’ve never been to before. the name of the church is the voice of victory and the pastor is Apostle Paul and his wife Theodora Azalekor. The drive to the church was harrowing to say the least. One of my least favorite things to do in West Africa is travel by car—especially at night when there are no traffic signs, nothing that looks like a road and no rules of the road! we arrived at the church after about an hour long drive. The building was lovely and the people were filled with the joy of worship. I did have an interpreter as always when I am in, it seems, but she was just great! the word was well received and I believe we were all impacted positively. my text was taken from Acts chapter 9 the entire chapter. when it comes to a divine encounter, the Apostle Paul Shirley had one it’s something to note how you can be on your way to do one thing, have an encounter, and wined up doing the complete opposite for the rest of your life. In Paul’s case he went from being a persecutor to being persecuted but was a former persecutor with power! First: When you have a divine encounter, no one will have to tell you who it is that you encountered. In Paul’s case he knew he was in the presence of the Lord! Second: When you have a divine encounter, your whole agenda will change! Once Paul recognized that he was in the presence of the Lord he had one question: Lord, what do you want me to do? Hallelujsh!!! When there has been a divine encounter, the thing that matters most, indeed the only thing on your mind will be God what do you want from me. Third: God can use the divine encounter of someone else to change the course of your divine encounter. While Paul was in the midst of his conversion, the Lord spoke to Ananias and gave him instructions concerning Paul. The Lord spoke to him in a vision and told him that Paul had also had a vision. when you and I have had a divine encounter God will speak to us in a way that connects us across cultures across language of cross experience across those things that normally would separate us. Lastly: A divine encounter can make your enemy your ally! Once Paul was the persecuted rather than the persecutor, the church had rest, the church had revival, the church had increase. All God has to do is meet your enemy in a divine encounter for a whole lotta stuff to change for a while lotta people! I challenge you, instead of praying that the Lord just removes your enemy, to consider praying that he change your enemy through a divine encounter. Sitting here watching Super Bowl 48 and at long last getting back to my “Father of the” blog. I first had the idea to use these posts to chronicle my experiences as a first-time father of the bride over a year ago when we were about 6 months away from the wedding of our first child. Well, the father-of-the-bride gig went wonderfully well and now I’m enjoying my new role as father-in-law. The “Father of the” blog was about more than capturing pre-nuptial nuggets. From ministry to love and marriage to fatherhood, all topics were/are fair game. Tonight as I watch the Broncos getting dominated by the Seahawks, my thoughts are about Israel. Our trip there ended just a week and a half ago but I still remember my first thought as we exited the 747 when we landed in Tel Aviv at around 3PM on Sunday, 1/19: The Earth is the Lord’s and the fullness thereof, the world and they that dwell there in. I’ve been blessed to travel to 5 continents and it never fails that I am struck by the same thought: People are people everywhere. Languages and cultures and colors vary but because God is a constant, I feel sorta at home no matter where I am.